Glary utilities is a PC cleaner and optimization software,it offers an all in one PC care solution-Fix registry errors,privacy protection and system cleaning,the software offer over 20+ system utilities to help you boost up your systems performance,using this software you can perform various optimizations on your system ,this software offers various functions like-Disk cleaner,Shortcut fixer duplicate file finder,disk defrag ,memory optimization and various others,one year premium subscription of glary utilities costs around 40$,but using this offer users can avail free 1 year license of glary utilities. 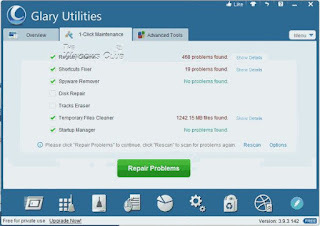 The pro version of Glary utilities features-Automatic background scanning,enhanced system fixing and optimization,auto cleaning 24/7 customer support,automatic updates and so on,Using this giveaway offer users can avail the pro version of this software for free and use it for 1 year free of cost. • Check before "I'm not a robot"
• Click on "Get My Key Now"
• Check your mailbox to get Licence Key.